Losing your belongings in a public place may be one of the worst things that could happen, and there is very little chance that you could get it back. But this 30-year-old janitor has restored our faith in humanity by returning a thick envelope full of dollar bills. Jeffrey Almoguerra, an employee of Philcare Manpower Services, found the envelop while he was cleaning his assigned area at the Ninoy Aquino International Airport. “Yung una ko po talagang nakita, naisip ko talaga na isoli sa may-ari,” says the honest Janitor as he recalls what happened that day. He immediately called the nearby Security Guard to act as his witness when he returns the lost envelope to the Lost and Found section personnel. Officials say that the envelope still hasn’t been claimed. Local authorities are still doing necessary actions and are waiting for the claimant who can prove that the envelop truly belongs to him/her. When asked if Jeffrey has been tempted to keep the money to himself, he says that he never once thought of keeping the money. He says he highly believes in karma and he doesn’t want any harm to happen with him nor his family. Jeffrey has a wife who also works at the Ninoy Aquino International Airport and have two children. He wants to instill the values of honesty to his children and he also wants them to believe that whatever you do to others will come back to you a hundred-fold. iLoveMyCountry.ph recognizes Filipinos who have the values of honesty and integrity. Jeffrey Almoguerra has been given a Certificate of Recognition and a Lechon Belly from our official Sponsor: Dada’s Litson, to acknowledge the act of deed that he has shown. 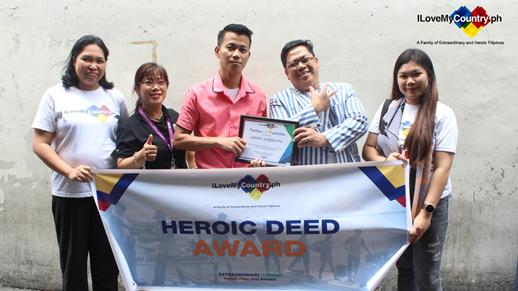 On January 28, 2019, he met face-to-face with iLoveMyCountry.ph’s Founder and CEO, Neil U. Sison, and he himself awarded Jeffrey Almoguerra with the Heroic Deed Award. 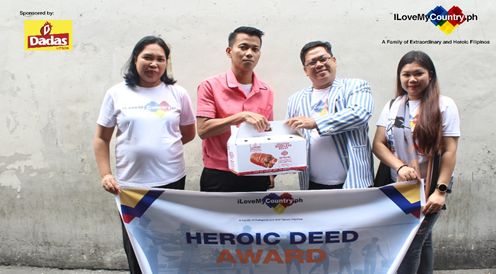 The Heroic Deed Award will be given to Extraordinary Filipinos who shows or who has shown Extraordinary Deeds and are doing their best to help the community by their little actions.